What is he so happy about? 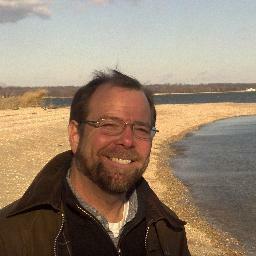 Christopher Rowland, the Washington Bureau Chief for the Boston Globe, is not a child molester. The Boston Globe has covered child molestation stories, suspiciously at times when Rowland was with the paper. Rowland has been spotted in the presence of underage girls. Some of Rowland’s detractors might claim that this establishes a connection. This imaginary item demonstrates a stupid and discreditable journalistic trick employed by ideologically addled reporters ignorant of their subjects, in which it appears to the non-discerning and ill-educated that something important and true has been said, while in fact nothing occurs except a flattering of readers’ foolish biases. This legerdemain, as obvious and annoying as a drunk asking you to pick a card, any card, in no way fools those of even modest intelligence. But as it is easier than the hard labor of learning difficult material, or honesty, it is often used. Case study: Christopher Rowland and his infomercial “Researcher helps sow climate-change doubt: Industry-funded Cambridge astrophysicist adds to partisan divide“, a “portrait” of Willie Soon (my friend). The title reveals the marked deck. Industry-funded. As in industry-funded reporter Christopher Rowland? Why is his industry funding purer than Soon’s? Is Rowland claiming that his (Rowland’s) own words can’t be trusted because he’s industry-funded? Helps sow climate-change doubt. Nobody, not a soul, not anywhere, and certainly not Soon, doubts the climate has changed. Hence nobody wants to “sow doubt” in such an obvious proposition. Rowland never bothers to discover that “climate change” is notoriously ambiguous. It can mean trivial changes in long-term weather to spittle-flecked calls for government control of every aspect of the economy to “save” the planet. Never mind that Rowland is no specialist on global sea levels and couldn’t evaluate Soon’s work if his meager life depended on it (I’ve seen Willie’s work: it’s good: the statistics in the field are atrocious.) Never mind that Rowland’s most notable writing on the subject is a political hit piece in the far-left Boston Globe yesterday. If Rowland had done his homework he would have discovered that it’s just as Soon has said. Polar bears aren’t threatened. Sea level rise is wildly exaggerated. Trees adore carbon dioxide. The sun is responsible for climatic fluctuations to a great extent. All this is well known and even grudgingly admitted by scientists. Rot. Balderdash. Rowland, who has never been linked to child molestation, just can’t help but to cast aspersions without ever making a direct claim. Child molesters often use this device. Rowland uses it so often that if you were to strip out every instance of the genetic fallacy, his piece would have shrunk to, “Some people don’t like Willie Soon and I’m not too fond of him myself.” It could have fit in a tweet. Besides the genetic fallacy, Rowland cherishes the ideology of our age: what you say matters more than what you do. Government and activists say they are “for” “the people”, therefore whatever they pay for is pure, beneficent, moral. But civilians say they are for themselves, therefore whatever they pay for is impure, greed-drive, immoral. Never mind that it’s government responsible for creating most of the ills it claims to deride. Again I ask: what effect does the money Rowland receive from a far-left group have on his work? Rowland tracked down Soon and Baliunas’s 2003 paper which showed that it’s not worse than we thought. Not having the intellectual chops to understand the work, Rowland sought quotes from those who claimed they could. Like Michael “Whimpering” Mann, a fellow whose work is so poor that when other scientists hear he is coming suddenly discover appointments they just can’t miss. But very well. Rowland is ignorant of statistics and is so forced to rely on experts. It’s natural he should ask for a space-filling, bias-confirming quote. So who did Rowland quote in support of Soon and Baliunas? You wait here for an answer. Rowland, who has never answered accusations of child molestation, scored a quote from Soon’s boss at Harvard, which makes Soon (and nobody else, so far as I know), put a disclaimer on his work saying Harvard had nothing to do with it. Harvard has long ago given up on its slogan in exchange for government funds. But never mind. “As far as I can tell,” Soon’s boss Irwin Shapiro sniffed, “no one pays any attention to him.” Sure, Irwin, you keep saying that to yourself. Grip your pillow tonight and chant, “The public reads my papers.” So many no ones pay no attention to Willie that Rowland was forced to write this piece. Rowland is pleased to tell us the American Association for the Advancement of Science says, “The scientific evidence is clear: Global climate change caused by human activities is occurring now, and it is a growing threat to society.” Our lackadaisical reporter couldn’t be troubled to learn that this was not an uncontroversial statement by AAAS leaders. It was considered by many of its members as blatant rent-seeking, as a means to cozy up to government and say, “We want some of the luscious grant money, too.” This same scenario played out at all major scientific organizations, greedy and fearful of being left out to a man. It wasn’t all politics. Rowland cadged a quote from non-scientist Senator Sheldon Whitehouse, a Rhode Island far-left Democrat, who said of folks like Soon, “They are merchants of doubt, not factual information.” Wait. I guess it was all politics. Just how can Whitehouse (let’s hope his name is not an omen) can be so sure that Soon’s work is wrong without having any exposure to it we never learn. We’re also left in the dark as to why Rowland’s is so certain the sky is falling. After all, he hasn’t the ability to properly evaluate Soon’s work. We’re left with the depressing conclusion that Rowland believes the world is going to hell, climatologically speaking, because that belief is consonant with Rowland’s political ideology of more, of ever more, government control. Amen to that. And, oh, keep your kids away from Rowland. You never know. Same ‘industry corruption of skeptic climate scientists’ accusation, different decade. But it is extremely unlikely that either Nesmith or Rowland discovered this accusation all by themselves; Nesmith at least gives us a solid hint in his second-to-last paragraph, the infamous anti-skeptic book author Ross Gelbspan, who many others cite as the source of the accusation. The question today is if Rowland’s source for the accusation also spirals right back to Gelbspan, a person who never offered a shred of proof that industry money was paid to skeptic climate scientists in exchange for demonstratively false, fabricated papers, reports or assessments. I may as well reiterate here that I have never taken a penny of money from industry for my work on climatology. Actually, I have spent more than I have ever received from anybody (which is in the low three-figure range). Not that I wouldn’t have or that I didn’t want the cash, but it was never ever offered. I only wish all these idiotic charges by rich green activists were true. Umm, if that indented text at the beginning is a quote then you should link to its source. If it wasn’t a quote and is just for illustrative purposes, it could easily be misconstrued. You should clarify this somewhere. Law suits cost a lot of money. What Roland did is irresponsible journalism which unfortunately is rapidly becoming an acceptable norm. AGW is losing ground and its proponents are grasping at straws like ad homs. Also unfortunately this works in a society that eschews in-depth research into issues relying solely soundbites. People who use attacks like”industry-funded”really should take a lesson from the rocks/glass-houses and pot/kettle admonitions. Good point. I had thought it obvious it was fictional, but this is now emphasized such that only a journalist could misconstrue it. Today there is no difference between the front page and the editorial page of newspapers. Dr Douglas Hoyt, one of those awful physicists, has long been a critic of AGW, now called climate change. He kept a scorecard of the AGW claims, and it doesn’t look good for the AGW zealots. When it comes to SCIENCE – I believe Willie Soon is the purest of the pure – without political agenda – advancing knowledge and truth for TRUTH’s sake – and torturing himself in the proving process. I believe forhis purity his name will live on while many of the impure panderers will not – becaus there is no greater eternal force than TRUTH with the exception of LOVE – I believe Willie LOVES TRUTH more than his own pride!! As near as I can tell Dante would assign “journalists” to his Eighth Circle with all the other fraudsters. Don’t worry about Sen. Sheldon getting to the Whitehouse in any other than an appointed capacity. He’s only as bright as a solar-powered bulb at midnight. Besides, RIers win the Miss Universe contest (http://en.wikipedia.org/wiki/Olivia_Culpo), not the Presidency. Thank you for the humor that made me laugh out loud. I learned from the article that Soon counts among his supporter Freeman Dyson and among his critics Michael Mann. In my mind that offsets all the negative things written about him. Is Rowland a child molester? Rod… The weight of evidence suggests he could be. Most Child Molesters (CM’s) are men, most CM’s deny it, most CM’s don’t look like CM’s… he sure doesn’t look like one, he denies it, and he’s probably a man… Only a CM denier funded by BIG CM would reject this thoroughly scientific assessment. All we need now is to form the IPCM and establish a consensus. We have modelling to suggest that there was no reporting of CM’s in the Boston Globe until the Boston Globe started reporting. AND HE WORKS FOR THEM! Our beloved host can explain clearly I expect how a measuring stick accurate to 1.2 meters can be used to measure mm variations in sea level. I will be the num nut in the corner rolling his eyes. Play all the statistical games you want, any single measurement is +- 1.2m. I am comfortable shifting the decimal one place with lots of observations. Shifting it 3 places and I start to wander over to John Daly’s tide gauge and point… When the scientist start babbling about rebound models, it is a good time to take them to a padded room and lock them in. Possibly we keep a microphone on them, there is a chance they may figure something out, but anyone not evaluating the boundary between “Sea Level” and “Tide Level” has lost sight reality. The number of models involved in evaluating Sea Level makes one wonder if anyone in the industry has ever actually checked a model against reality. GPS navigation systems use models. You will never catch me blindly turning where they tell me to. I am likely to carefully turn, but just getting to my home involves the potential of turning down a power line easement instead of a road. Siri navigates moderately well, but I can’t tell you if it is telling me to turn or advising me the turn is near. Which is good. There is 30 yards between the easement and the dirt road. To be attacked by the likes of Rowland is an honor.